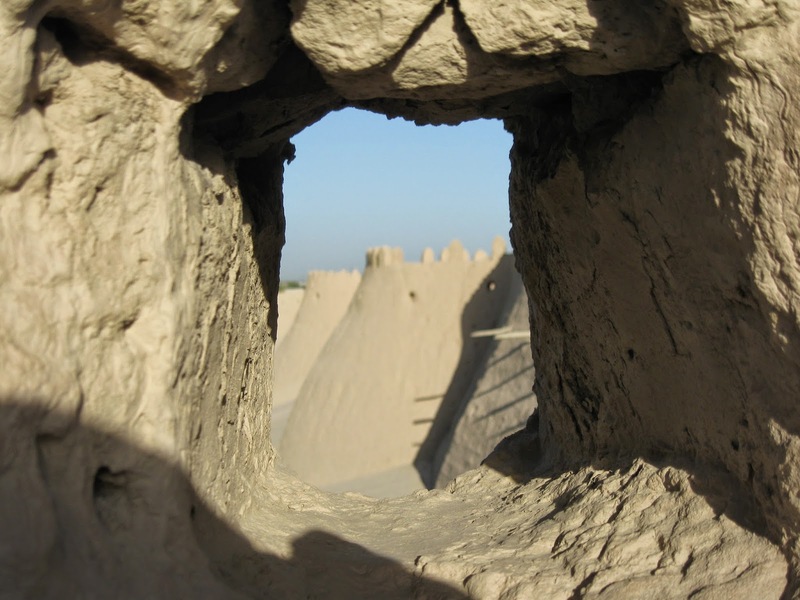 Khiva, like Bukhara, was a powerful city state on built on an old oasis between the Kyzl Kum and Kara Kum deserts. It grew to become a major trading post on the Silk Road, building up a specialty in slave trading. 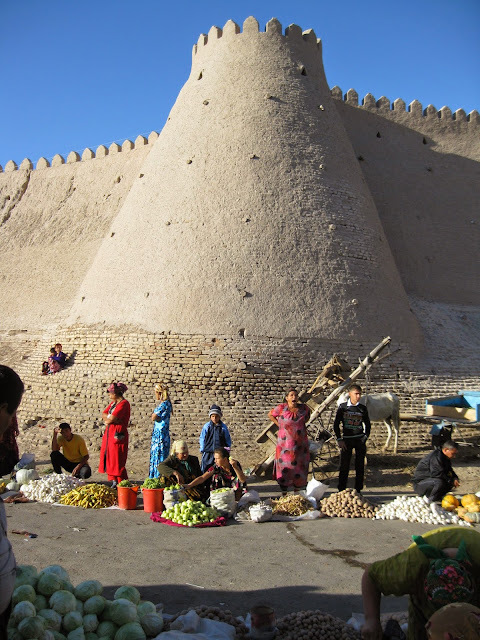 Khiva continued to grow and developed a small empire, including much of modern day Turkmenistan, before it was overcome by Russian forces in 1873. With the formation of the Soviet Union it was included rather strangely in Uzbekistan, despite its people being mainly Turkmen in origin, and its history intertwined with that of Turkmenistan. Much of the original city lies intact behind the vast city walls. 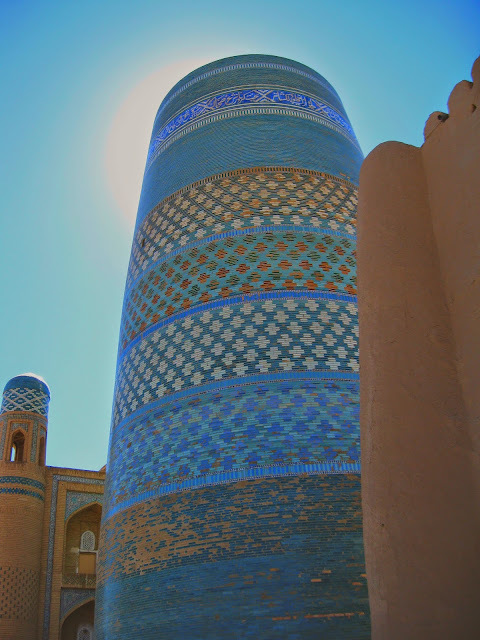 Mosques, Madrassah, Mausoleums and Minarets are located in between the tiny winding alleys and collections of small homes that still house many Khiva residents, ensuring that it is a living working city and not a museum. The desert conditions have helped to keep the buildings wonderfully preserved, and wandering around early in the morning you can imagine that little has changed in five hundred years. At one corner lies the Kalta minor minaret, pictured below. Muhammed Amin Khan, the Khivan ruler in the early nineteenth century decided to build the largest Minaret in the world, to be able to see the rival city state of Bukhara 400 km away, and show off his power and religious devotion. He died in 1855, and it was decided the expense was too great and so it remains, resembling a barrel covered in beautiful glazed aquamarine tiles. After spending a morning walking around the outside of the city walls I walked into the new part of Khiva, and came across a small row of stalls selling snacks and beer. One of the beer stalls sold only dark stout, very similar to Guinness, made locally. It was delicious, even if not served as cold as I would have liked it, and extremely potent, encouraging me to have a long afternoon nap and avoid the worst of the heat of the day. Khiva is also the birthplace of Al-Khorezmi, who, to the delight of children studying maths at schools across the globe, came up with Algebra. He really should have just enjoyed the rather potent local stout beer instead.